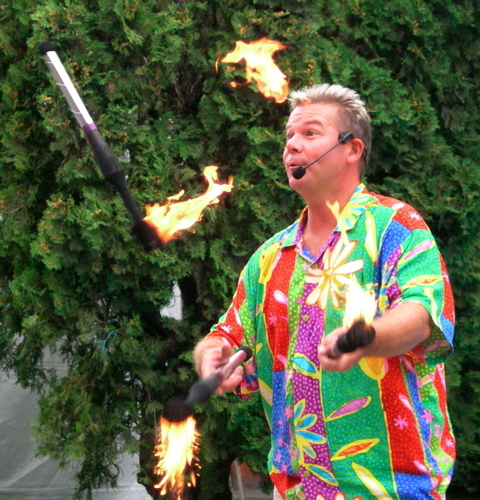 Mike Battie has been safely juggling fire for his audiences for 20 years. 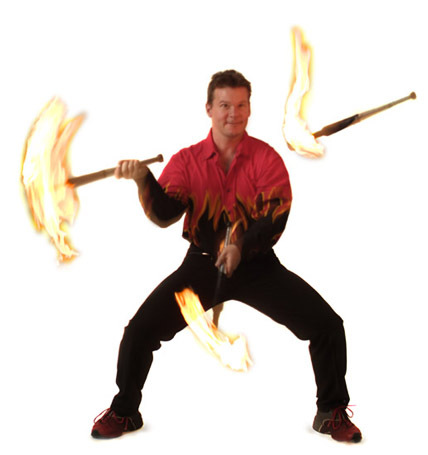 His specialty is the juggling of three torches, but he is also a master with flaming devil sticks, chains, and staff. 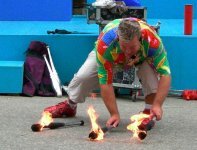 Mike has choreographed and perfomed in large scale fire shows for the Pacific National Exhibition, as well as at Fairs, Festi vals, and numerous other events (including the North Vancouver Hose Reel Competition for the firefighters of the lower mainland of Vancouver). The absolute safety of his audience is Mike's highest priority, which he achieves by paying careful attention to procedure. He has worked extensively with fire on movie sets, television shows, and for commercials, accomplishing his tasks in some very tight situations. Mike warming his hands before a show. Mike Battie lighting his juggling clubs by striking them on a rough surface.